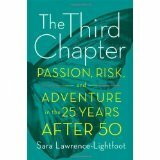 The Third Chapter by Sara Lawrence -Lightfoot is a great book on understanding this Third Chapter of life and how we as career practitioners can help people successfully navigate aging. She states this navigation requires curiosity, adaptability, engagement in new perspectives, skills, experiences, and vulnerability & uncertainty. Yes, it complicated but millions of Boomers are facing this time in their life that will require assistance. This is a new experience for millions as many of us looked to retirement for our entire career and then realized that we still want to give forward, be useful, and create new meaning in our lives. And there is still plenty of “life” left. I enjoyed her perspective or working with people to navigate this time and the many issues we face from transitions, health, looking back and giving forward, and how to work with the younger generation. What struck me was that her clients all seemed to be fairly well off, highly educated, professionals and some of her examples made it difficult for me to bring back to the people I work with more often, middle class, educated / skilled, but not the “jet set” she uses for her examples. If you are interested in discussing this topic further, you might be interested in my 5 week, discussion-based online seminar for career practitioners called Working with Boomers to Reinvent Retirement. If you are interested in understanding transitions better, check out this discussion-based online seminar, Understanding Transitions.